NORMAN —Tears slowly fell down ShaeBug Scarberry’s face as she stood near her Purcell teammates with the state championship trophy. She had won the Class 3A individual state championship and her team had won the state championship for a third time in four years Thursday without even swinging a club. A miserable 2017 of runner-up finishes no longer mattered. Yet, she still felt like she left too much on the golf course the day before. Thursday was not a normal day. Class 3A’s girls golf state tournament at Westwood Park was washed out, the result of heavy rainfall. Class 5A was also canceled in Muskogee. First-round scores became the final scores. And tears fell all around in Norman. Read the complete story at The Oklahoman here. MUSKOGEE — Nina Lee made a habit of finishing in the top 10 at Class 5A state tournaments in previous years. Her high school career had seen her come close to winning a championship before, and this year she did just that. 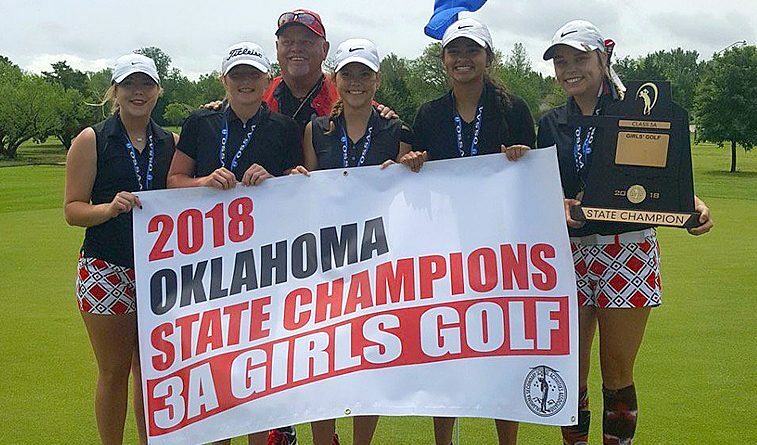 The Collinsville senior fired a 2-under 70 on Wednesday at the Class 5A state tournament, and her score ended up nabbing her a state title after Thursday’s final round was canceled due to inclement weather at Muskogee Country Club. Lee’s total ended up being the only round under par Wednesday. Her teammate Madison O’Dell finished second with a 73. Duncan, for the second year in a row, won the team championship. The Demons finished with a 314 on the first day of the tournament, and that was good enough for a 26-stroke victory over Collinsville (340). Plainview shot 309 as it won the Class 4A girls state championship by 16 strokes Thursday at Lake Hefner South golf course. The second round was delayed by two hours after heavy overnight rain soaked the course. Katie Finley shot 144 and finished third individually to lead Plainview, which had four golfers finish in the top seven. Newcastle’s Chloe Black shot a 67, the only round under par during the two-day tournament, for she rallied from four strokes back to win her second individual state championship. Black, who signed with Central Oklahoma, made birdies on two of her first three holes. She held off Hilldale’s Jordan Clayborn by one stroke and finished five shots clear of Finley, who was the individual leader after the first day. Ada: Hannah Price, 84-93—177; Lauren John, 94-96—190. Ardmore: Katie Long, 87-92—179; Kacy Benson, 91-93—184; Kalie Davis, 94-92—186; Maile Glaser, 99-88—187; Eryn Guinn, 117-98—215. Broken Bow: Kinley Sanders, 107-103—210. Sydney Manning of Cashion shot 80-77 to win the Class 2A state championship while Tishomingo finished 29 shots ahead of Henryetta for the team title at Aqua Canyon in Guthrie. Tishomingo was led by senior Bailee Barnes, who finished with a team best 170. Barnes finished No. 7 overall and teammate Kristen Lovett finished No. 8.